Ashtabula City Council undertook bestowing the honor on Schultz earlier this year, and the signs have now been placed. Eli Kalil sent a photo to Schultz of the sign placed on Lake Road, just before Kent State University at Ashtabula, last week, and she responded on her Facebook page. “Thank you, Ashtabula. I will try to find the words to let you know what this means to me,” Schultz said. As people left comments of praise on the post, Schultz further responded, “This is the kindest thread. Thank you, everyone. How I wish my parents, Janey and Chuck Schultz, could see this. Mom would be telling everyone. Dad would insist I stand next to it for a picture and then say, ‘Don’t let it go to your head,’” Schultz wrote. She is a nationally syndicated columnist for Creators Syndicate and also has written two books, “Life Happens: And Other Unavoidable Truths,” a collection of her previously published columns, and “... and His Lovely Wife: A Memoir from the Woman Beside the Man,” a journal of her experiences on the campaign trail for her husband, Sen. Sherrod Brown. In June, she received the National Society of Newspaper Columnists 2018 Ernie Pyle Lifetime Achievement Award. Ashtabula City Council President John Roskovics said he’s already seen numerous positive comments about the sign. 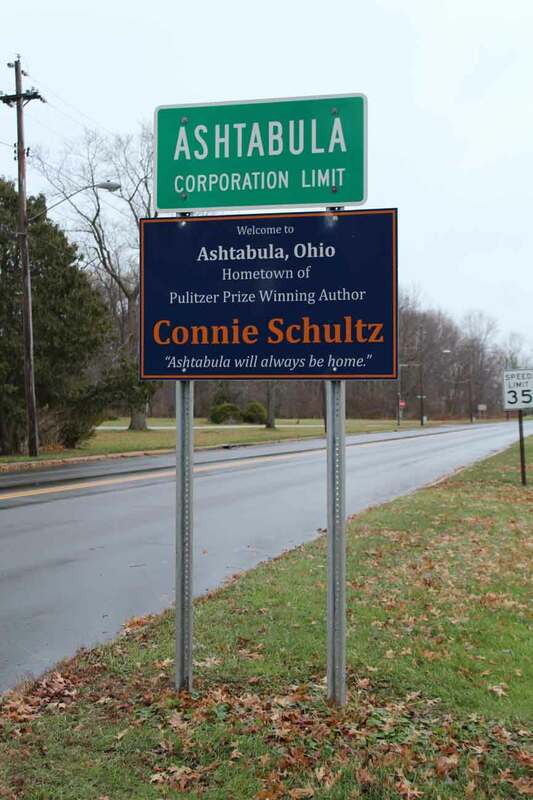 A sign honoring Ashtabula native Connie Schultz, a Pulitzer Prizewinning writer and journalist, has been placed on Lake Road, just before Kent State University at Ashtabula.